Pathologists at the Abu Kabir Forensic Institute have been able to identify on Monday body tissue from the remains transferred to Israel by Hizbullah as belonging to five IDF soldiers who were killed in the Second Lebanon War. The IDF soldiers whose remains have been identified are: Major (Res.) Nissan Shalve, 36, from Kibbutz Evron; Captain (Res.) Daniel Gomez, 25, from Nehalim; First Sergeant-Major (Res.) Ron Mashiah, 33, from Gedera; and Major Sami Ben-Naim, 39 from Rehovot. All four for aboard a Yasur helicopter which was shot down during the war. The fifth soldier whose remains were identified was Sergeant-Major Gilad Zusman from Eli, who fell in battle on August 2006. IDF officered have notified the soldiers' families of the match, leaving them to decide on the manner in which they would like the remains to be laid to rest; but nevertheless, the institute's testing on the remains that were transferred to Israel is ongoing and may take several weeks more. The IDF confirmed recently that 20 of the war's fatalities were not buried intact. DNA samples were taken form all of the fallen and the military has precise documentation of the body parts missing. The box containing the remains of soldiers killed in the war was turned over to the Red Cross Sunday upon the arrival of convicted Lebanese spy Nissim Nasser to the Lebanese side of the border. The box also contained First Sergeant-Major Mashiah's dog tag. The tag was presented by Lebanese newspapers earlier this year, when Hizbullah chief Hassan Nasrallah first announced that his organization had the body parts of IDF soldiers. The Mashiah family was received it on Monday. "This won't bring him back anymore, but it's still an item which he held on to in his last moments. 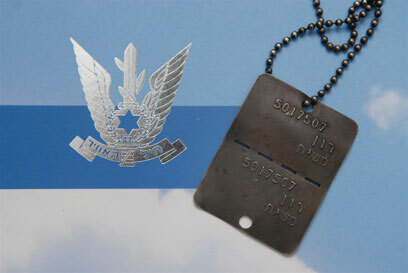 It has sentimental value which cannot be ignored," bereaved brother Motti Machiah told Ynet. "There is no doubt that this brings everything back. The tag is with our parents now, for safe keeping, and one day we will give it to his son, so he'll have something to remember his father by," he said. The family, said Motti, was surprised to get the dog tag, and it supports the State's endurance of Hizbullah pressure: "One good thing you can say is that the State never gave in to (Hizbullah's leader Hassan) Nasrallah's demands and held its ground. Even if there is anything left behind in Lebanon, the State mustn't trade anything for it." The family, he added, believes the State must refrain from striking deals for body parts of fallen Israeli soldiers. "This is not negotiable. The State shouldn't have to pay for bodies, body parts or any other items. The State has to draw the line and not cross it." See all talkbacks "Retrieved remains: Forensic Institute identifies body tissue of 5 IDF soldiers "